Abstract: It was proposed and designed a modern configuration control type multicontroler-multimodel (MM) that pilots nonlinear combustion process of the diesel engine, needed to adjust the pressure in the intake manifold and air flow circulating through the compressor. The MM simulator developed by the authors allows the implementation of control systems represented by pairs (Mi, Ci) with the Mi candidate closest to the current operating point of the process and the paired controller Ri, for controlling the key parameters of the combustion process. The proposed configuration is built with robust controllers and thus is able to ensure superior performance, tolerance to nonlinearities and parametric/ structural perturbations in the system. Keywords: Diesel engine, dynamic models, optimal control, robust control, MM simulator. Multi-model control strategy for nonlinear systems configuration is a relatively new approach. In recent studies, one can find an ever increasing interest for management control of nonlinear processes or multimode operations, as diesel engines can only be roughly approximated by a single global model. The first works that have proposed solutions and methods suitable for this type of processes, relying mainly on the construction of adaptive-robust systems using classical algorithms are those of Balakrishnan and Narenda in the 90s. Later detailed studies and positive results were presented by Athans (2006) who used the concept of multimodel control and demonstrated the effectiveness of this approach, with the risk of additional computation and implementation effort. The principle of building an MM configuration is the same, and is based on known identification procedures of Mi models and design of control algorithms Ci, the differences are mainly due to the selection mode and command switching. Studies by Petridis, Kehagias and Toscano use the multicontroler-multimodel (MM) configuration for systems with nonlinear static characteristics and Landau and Karimi use the so-called Cloe (Closed Loop Output Error) procedure, adjusting the parameters in an MM control structure . Later studies have appeared on the use of neural networks and fuzzy logic systems, involved in the development of MM structures. Research by the authors has been focused on proposing and testing control configurations MM for nonlinear processes implemented on certain applications designed to control the combustion process parameters in the diesel engines. Following the preliminary results obtained in the paper, the proposed solution consists of a control structure (MM) in a robust version, to be tolerant to nonlinearities and disturbance regime of the diesel engine combustion. 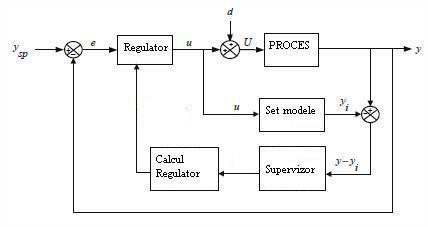 The management configuration used here contains control loops (feedback) with pairs of models, robust controllers designed for the pre-specified operating points of the nonlinear characteristic of the process, caused mainly by the variation engine load and actuators behavior. We fix three possible operating points and for the designed (Mi, Ci), i = 1,2,3, systems, presumably linearized model Mi is disrupted in parameters and/or structure, there is a robustness analysis of systems in closed loop and adjust the nominal command but for all operating points preset. An adaptive strategy MM structure occurs when the engine is in operation between two operating points. y – yi – difference between process output and i model output. The supervising module must choose the right model and control algorithm for the engine functioning point. Thus we define the model error, calculated at each sampling moment and which represents the difference between output yi and output y for the same u value of the applied command. where α >0and β >0are the criteria ponderation factors, and γ >0is the forgiveness factor which ensures its action window limitation over the model error ε i(k). good performances in detecting the process parameters modification. The MM structure is configured for the proper version for controlling faster systems encountered in the case of controlling the working parameters of the diesel engine. For each identified Mi model was computed a Ci regulator (controller) that meets the objectives and performance requirements; so we provide the set of pairs (Mi, Ci), corresponding to the possible nominal operating points Pi. For Ci control algorithms, robust correction was applied. BALAKRISHNAN, J., Control System Design Using Multiple Models, Switching and Tuning, PhD Thesis, Yale University, SUA, 1996. DUMITRACHE, I., Ingineria Reglarii Automate, Politehnica Press, Bucharest, 2005, ISBN 973-8449-72-3. LANGLOIS, N., Contribution à la modélisation et à la commande avancée des moteurs Diesel, 2008, Universite de Rouen. LUPU, C., A. UDREA, D. POPESCU, C. FLUTUR, On the Stability of Switching in Multiple Model Control Systems, Politehnica University Bucharest. 2009a. 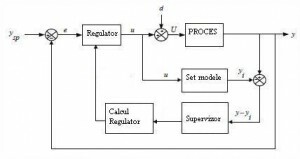 LUPU, C., D. POPESCU, B. CIUBOTARU, C. PETRESCU, G. FLOREA, Switching Solution for Multiple-models Control Systems, Politehnica University Bucharest. 2009b. JANKOVIC, M., M. JANKOVIC, I. KOLMANOVSKY, Constructive Lyapunov Control Design for Turbo Charged Diesel Engines. IEEE Transactions on Control Systems Technology, vol. 8, 2000, pp. 288-299. JUNG, M., Mean-value Modeling and Robust Control of the Air Path of a Turbocharged Diesel Engine, PhD thesis, University of Cambridge, 2003. PAGES, O., P. MOUILLE, B. CARON, Multi-model Control by Applying a Symbolic Fuzzy Switches, IFAC, 2000. POPESCU, D., D. STEFANOIU, Industrial Control, Ed. Agir, Bucharest, Romania, 2007. SODERSTROM, T., P. STOICA, System Identification, Prentice Hall, London, 1989. NARENDRA, K. S., J. BALAKRISHNAN, Adaptive Control using multiple models, IEEE Transactions on Automatic Control, vol. 42, no. 2, February, 1997, 171-187. LUPU C., D. POPESCU, C. PETRESCU, Multi Model Adaptive Control System, ISAS‟99 Conference, U.S.A., Orlando, 13-15 August 1999. LUPU C., D. POPESCU, C. PETRESCU, Al. TICLEA, C. DIMON, A. UDREA, I. BOGDAN, Multiple-Model Design and Switching Solution for Nonlinear Processes Control -, ISC’08, The 6th Annual Industrial Simulation Conference , 09-11 June, 2008, Lyon, France, pp. 71-76, ISBN 978-90-77381-4-03. JENSEN, J. P., A. F. KRISTENSEN, S. C. SORENSON, N. HOUBAK, E. HENDRICKS, Mean Value Modeling of a Small Turbocharged Diesel Engine, SAE Paper 910070, International Congress and Exposition, Detroit, 1991. JUNG, , K. GLOVER. Calibratable Linear Parameter-varying Control of Turbocharged Diesel Engines. IEEE Transactions on Control Systems Technology, vol. 14, 2006, pp. 45-62. LARSEN, M., M. JANKOVIC, P. V. KOKOTOVIC, Indirect Passivation Design for a Diesel Engine Model. In Proceedings of the 2000 IEEE International Conference on Control Applications, USA, 2000, pp. 309-314. DEC, J. E., K. EPPING, S. M. ACEVES, R. L. BECHTOLD, The Potential of HCCI Combustion for High Efficiency and Low Emissions. Society of Automotive Engineers. 2002-01-1923. JOHANSSON, R., D. BLOM, M. KARLSSON, K. EKHOLM, P. TUNESTAL, HCCI Engine Modelling and Control using Conservation Principles. Society of Automotive Engineers, 2008-01-0789.